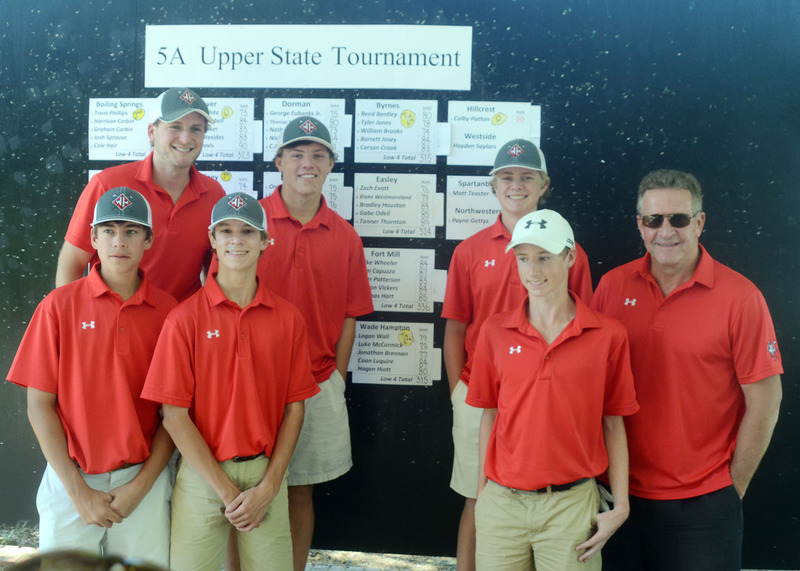 Wade Hampton finished in a tie for sixth place at the Upper State AAAAA tournament. The Generals will be making their first trip to the state tournament in at least 14 years. The Upper State AAAAA Qualifying tournament does not give out trophies or honors winners. Instead, the top eight teams get a chance to keep their season going by playing next week in the state championship. Most teams come to the tournament with the idea of simply qualifying. You don’t see a lot of high-fives or celebrating among the top teams. It is routine. They play well and advance to the championship, just like they do most years. Just like they expect. This year one team did not act as if they had been there before, because they had not. In fact Wade Hampton of Greenville had not been playing this late in the season for at least 14 years. “This was not one of our season goals,” said coach Zack McCrary. “We have such a young team we just wanted to get to the region and be competitive. We didn’t expect to be going to state, but we will take it,” said the coach. 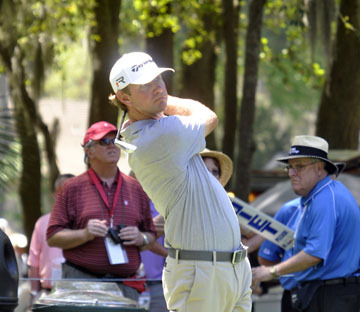 Lucas Glover won two AAA individual titles while a student at Wade Hampton in 1994 and 1995. 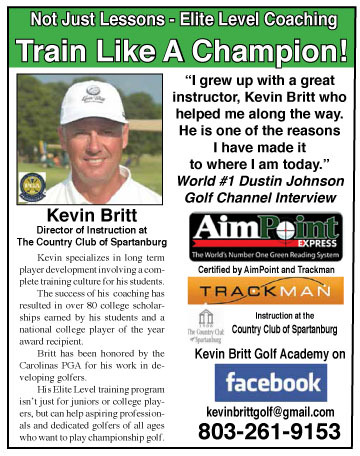 Wade Hampton’s most famous golfer graduated from the school back in the late 90s. Lucas Glover was a AAA state champion and went on to be an All-American at Clemson. He won the US Open, but his high school career ended almost 20 years ago. The school was the state runner-up in 1997, but you have to dig deep into the record book to find a state golf title. The Generals won a Class A championship in 1965. “It has been a dry spell for us, but things are changing. Our guys are all committed to getting better and we are on the way. It may take us a couple more years, but making the state tournament puts us ahead of schedule,” said McCrary. The Generals were led by Jonathan Brennan who shot a 5-over par 77. Logan Wall, Luke McCormick, Coan Luquire and Hagen Hiott all pitched in to help Wade Hampton advance to play at Wescott Plantation in Summerville next Monday and Tuesday. “This is a true Cinderella story. We met all our season goals and now playing in state is going to be a big boost for us going forward,” added McCrary. Even without a trophy up for grabs the battle between the defending champions from Boiling Springs and last year’s runner-up Gaffney continued. At Fox Run Country Club the Bulldogs and the Indians swapped the spots they had earned at the Region III championship a week ago. Gaffney was the runner-up in the big school division last year. 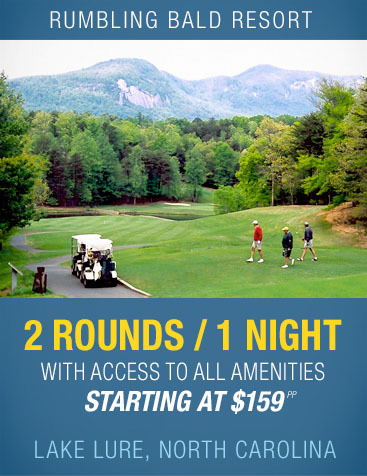 The Indians are hoping a top finish in the Upstate qualifying tournament helps them at the state championship. 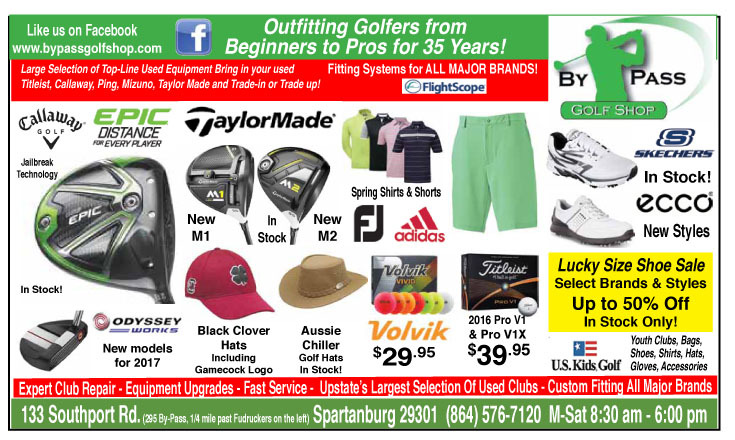 Last week it was Boiling Springs shooting a sensational 274 total to win the region by 13 shots. This week it was the Indians posting a 287 score to win the top qualifying spot from the Upstate by 11 shots over Boiling Springs. “We finished a lot better this week than we did last week,” said Gaffney coach Brandin Coggins. “This is the kind of round we are capable of playing when we are all playing well,” said the coach. The Indians were led by Ross Joliff, who had his best round of the spring season. Gaffney’s only senior fired a 2-under par 70, which included a 31 on his final nine holes. “Ross played great. Seth (Taylor) had another good round and finished under par. Zack Gordon was steady and Cody Transeau continues to be solid,” said the coach. Brock Hamrick rounded out the Gaffney team at the Upstate tournament. Boiling Springs didn’t play badly. The Bulldogs shot a good score, but it was not their best effort of the spring. The team finished at 298. 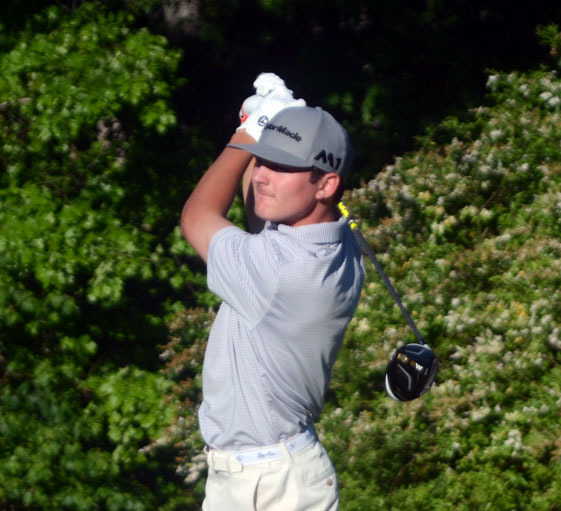 Trent Phillips continued to dominate individual competition in AAAAA golf. The Bulldog junior opened with an uneven nine holes and then turned up his game on the back nine to finish at 5-under par 67. The future Georgia golfer has won the Region title and now the Upstate title as he tries to win his third state championship next week. 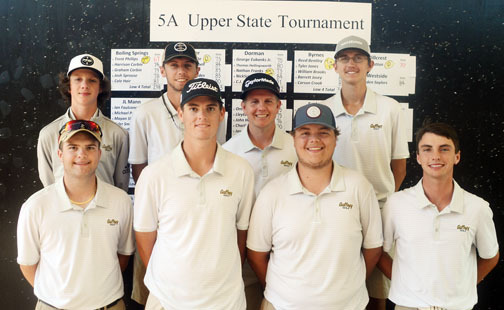 After Gaffney and Boiling Springs the other six teams to qualify for the trip to the state championship in Summerville next week were 3) Rock Hill – 305, 4) Tie, Nation Ford and Dorman – 312, 6) Tie, Mauldin, Byrnes and Wade Hampton – 315. Four individuals also advanced to the state championship from the Upper state tournament. Future Clemson golfer Colby Patton from Hillcrest finished second in the individual competition shooting a 2-under par 70 for one of the qualifying spots. Andrew White from Clover got the second spot. Matt Teaster from Spartanburg won a four-way playoff with a birdie on the first playoff hole to get the third qualifying spot. Zander Briggs of Woodmont parred the playoff hole to earn the fourth and final individual spot to advance to the state championship on May 15th and 16th.